Description: Snowberry is a medium sized shrub, growing in thickets and up to six feet tall. The leaves are simple, opposite, deciduous, and variable in shape. They are generally oval but can be nearly round (3/4 – 2 1/2” long). The leaf edges vary from entire to shallowly lobed on the same plant and same stem. The flowers are small (1/4”), pink-white, bell-shaped, and found in clusters at the end of the branch. 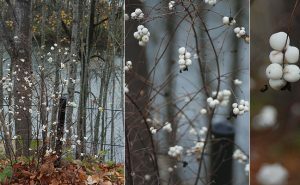 The round, white, waxy berries persist into the winter; they are non-edible to humans and toxic due to the saponin they contain. Twigs are opposite, slender, smooth, and yellow-brown. Wildlife Value: Snowberry is useful to pollinators as a host and food plant. The flowers attract Anna’s and rufous hummingbirds, as well as various insects including bees. Several birds have been observed eating the berries, such as towhees, thrushes, robins, grosbeaks, and waxwings. Birds also use snowberry thickets for cover. In addition, the Vashti sphinx moth (Sphinx vashti) relies on it as a food plant in its larval stage. 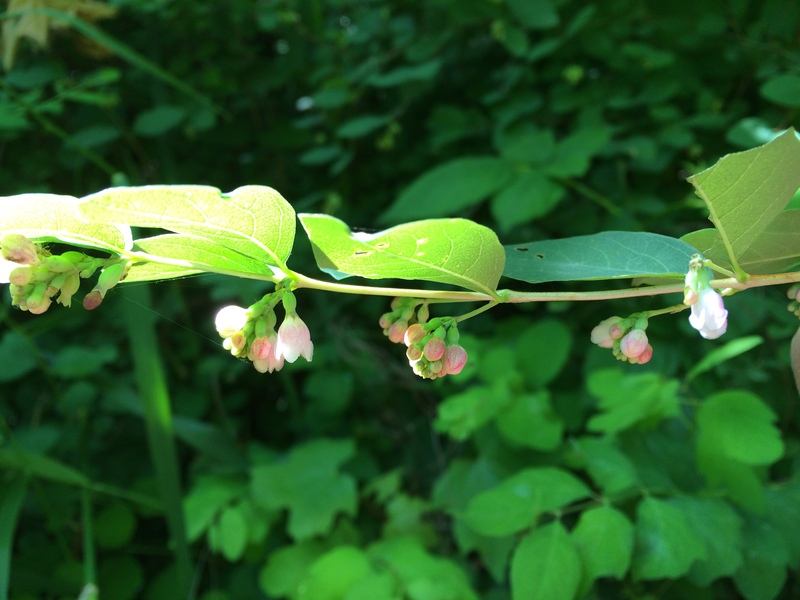 Management Considerations: Following harvest, snowberry resprouts readily from belowground. To ensure optimum survival and growth of planted trees, control snowberry where it is likely to overtop planted seedlings. 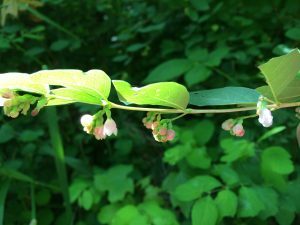 Consider retaining snowberry plants on the site where they are not in direct competition with seedlings. 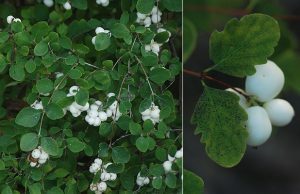 For those who would like to actively enhance wildlife habitat by planting snowberry, it tolerates a variety of environments, and can be planted in coarse sand to fine-textured clay, full sun to dense understory, dry well-drained slops to moist stream banks, and low to high nutrient soils. It also establishes readily and tolerates general neglect. If you are interested in learning more about creating wildlife habitat on your property, check out the Woodland Fish and Wildlife website.